I’ve been meaning to share my experiences with everyone sooner, but thus far it has been a blur of movement since we got here. Like I mentioned in my previous post, this trip is focused mainly on visiting breeders down south. Unlike visiting Niigata, the Koi breeders in Southern Japan are a lot further from each other. On average, it takes about an hour and a half to get from one breeder to another and on some occasions multiple means of transportation is necessary. So much has happened already since we arrived and while I am so excited to share, I thought it best to break up the narration of my experiences into more than one blog post. When we arrived in Japan two days ago, our first order of business was to make sure we had all our gadgets and gizmos for the trip set up. Shawn had rented a portable wi-fi device so we can stay connected to the rest of the world no matter where we went. Nowadays most Koi farms have wi-fi available for customers to use, but for the most part the service is limited within the confines of their main office space. Since we were going to Manila for the Philippine Koi Show right after the All-Japan Shinkokai Koi Show, we had a good number of luggage with us that we were bringing to the Philippines. So instead of lugging around more than the necessary amount of things we needed for the trip, I called Tito (Uncle) Kenji and asked him if it was alright for us to leave our stuff at his farm in Narita while we were going around the different breeders. The first farm on our itinerary was Sakai Fish Farm in Hiroshima and we were scheduled to take the first plane out of Haneda Airport to Hiroshima Airport. We rushed to the Narita train station to catch the last couple of trains to Haneda where we would be spending the night. While Koi is always the main thing on our to-do list whenever we go to Japan, there is always something new and exciting to be discovered about this country especially because the Japanese people are among the kindest and most warm-hearted people as a whole. We checked into our hotel then promptly headed out for dinner. After scouting a few restaurants, we decided on a restaurant that featured a surf board outside the door. 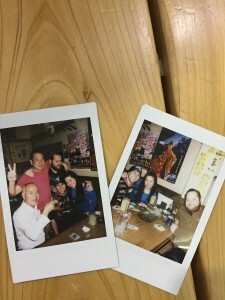 To say that the restaurant owner was excited to see foreigners enjoying Japanese food was completely an understatement. Apart from what we ordered, he kept giving us several things to try. He told us all about his hometown, Okinawa and how this time of the year was perfect for viewing the blooming cherry blossoms. We all know that when buying Koi in Japan, relationship with the breeders are very important for many reasons. Your relationship dictates not only the price of your koi or the quality of Koi available to you, but most importantly if you can buy Koi at all from their farm. This culture, though is not limited to the Koi industry, but is something that runs deep through Japanese culture in general. While we were sitting there, we noticed that the owner of the restaurant was making conversation with everyone in the room on a first name basis. Among these customers was a young lady who was eating by herself. She had brought a gift for the shop owner from her hometown in Hokkaido. 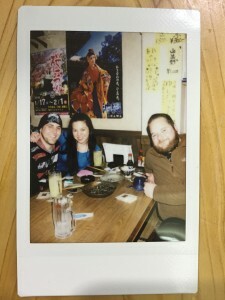 Before we knew it, Zenko-san (the shop owner) was making introductions and we found ourselves sharing a meal with her. Her name was Kim-San and she is a flight attendant for a local airline and was waiting to be joined for dinner by her pilot friend. When he arrived we all shared a meal and had a good time like friends who had known each other for years and years. 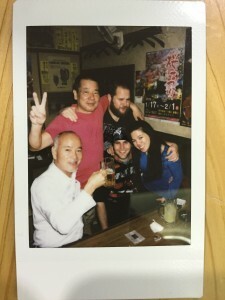 Kim-San had a Polaroid camera with her and she vet generously gave us photo souvenirs to remember our time together. 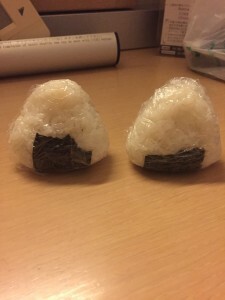 As the night came to a close, Zenko-san gave us a bag of onigiri (stuffed rice balls with seaweed wrap) to have for breakfast tomorrow. How sweet was that?? We called it a night and couldn’t help but think what an amazing start we had to this trip.